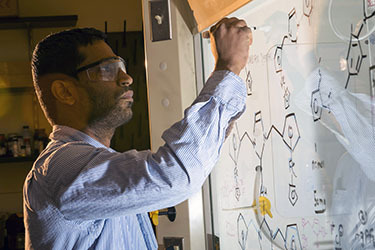 The Department of Chemistry offers a combined degree program, which allows a student to earn both a B.S. (Chemistry) and M.S. (Chemistry) degree in 5 years. As outlined below several courses and multiple credit hours will be applied toward both the B.S. and M.S. program requirements. The program cannot be entered until the first semester of Physical Chemistry has been completed (i.e. normally during the second semester of the Junior year). The student must have a minimum GPA of 3.5 overall and in the required courses for the Chemistry degree. The above stated GPA must be maintained during residency in the program. This is a research only thesis-option, thus a completed research thesis and oral defense are required. 30 semester hours of graduate work for the M.S. portion of the degree. A minimum of 9 credit hours of CHM 4990 with a maximum of 6 counting toward the M.S. degree (taken during the third or fourth year of the B.S. degree). A minimum of 6 credit hours of CHM 8980. Must meet the core course requirements for the M.S. degree. Up to 12 semester hours of courses taken at the 6000 level or above may be counted toward both the B.S. and M.S. degrees. Completing the core course requirements (Inorganic, Physical, Analytical, and Organic). An annual review by the thesis committee – after the B.S. degree has been awarded. A departmental seminar – as part of the CHM 8000 course. Writing and defending a thesis. Registering for and attending CHM 8000 during both the 4th and 5th years of the program. It is anticipated that the student will provide his or her own financial support throughout the program. However, it may be possible to be supported via a Graduate Teaching Assistantship (GTA) or Graduate Research Assistantship (GRA) during the fifth year of the program. There is no guarantee that funds will be available for support through either of these mechanisms. Failure to maintain a GPA of 3.50 during program residency or meet the necessary requirements for the M.S. degree may result in dismissal from the program.